The guy who found it is willing to part with it. It doesn’t have much value to me except to hang on the wall. Of course special education has a birthday coming up... he could hang it on his wall... or use it as a soup dish... LOL. yes I know what I spelled... anyway, he wants me to make an offer... what would be fair? I worked for Oldsmobile when these came out and thought they were pretty slick. This dose sound like it belongs in a horror movie though. What I heard was they made the car heavy but that was pre oil embargo. I love the car but the setting is great too. What lake? North shore? The flag on the boat explains it all... LOL I guess it was before the maple leaf flag which means you must be really old... LOL The boat looks like a dandy. Still have it? My grandparents were too frugal to get a Buick. At the time this picture was taken they drove a Studebaker. I am guessing about a 1951. They traded it for a 1957 Chevy. 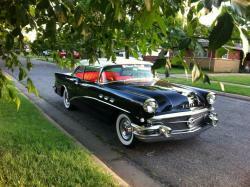 The Buick in the photo would have belonged to my uncle who owned a Buick dealership. I am sure this Roadmaster had everything offered. Everyone is giving good advice and info. Auveco makes the clips. When I bought I got full boxes of the ones I would use the most of. Yes, compare the sizes to the trim at the locations of the holes in the fender. I see no advantage using old clips even if they are usable. I worked for GM in the early '70 and believe it or not there were things such as this that were "choose what fits best" when the first couple cars went down the line at model changeover. They sent one of the new models along with with the old about a month before they quit building the old so they could make sure things went together correctly. Things sometimes changed mid mid year too. I have a copy of the official Buick magazine dated November 1955 which had a photo of a dealership in an unidentified location. I did some research and found it not far from you, in Detroit, depending on your definition of IN Detroit.